The Bellingham International Railroad is a grand title for a tiny 2.5 mile shortline running on fragile former Milwaukee Road track within the city limits of Bellingham, in the northwest corner of Washington State. Not only is this railroad short, its name is nowhere visible on the property, it owns no motive power, has no employees, and serves only one customer. Bellingham International's single shipper is also the road's owner, Bellingham Cold Storage, which formed the railroad to insure continued rail service to its Orchard Street facility, located on a portion of Milwaukee Road's branch between Bellingham and Sumas on the Canadian border. Bellingham International is the sixth railroad to operate over the tracks of what was known as the Squalicum Line, named for the creek it follows on its journey east and upgrade from Bellingham's waterfront. The Squalicum Line was originally constructed by shortline Bellingham Bay & British Columbia Ry. in 1912 as alternate route to its original mainline between the port city of Bellingham and a connection with Canadian Pacific at Sumas, Wash. The original line, completed in 1891, left the waterfront of Bellingham by means of a steep grade up to the main level of the city. Lnown as the High Line, this route then continued through several blocks of street running and struck out north and east toward Canada, encountering more steep grades on the outskirts of the city. To ease the problems created by both the street running and the grades, BB&BC constructed its Squalicum Line. Stretching around Bellingham's semi-circular waterfront from BB&BC's dock and yard, the line remained at sea level for it's first couple of miles northward. At the north end of the waterfront, the new line curved west toward the water, before swinging east to follow Sqaulicum Creek up a ravine in the coastal bluffs bordering Bellingham Bay. After climbing the ravine, the rails circled around the outskirts of the city connecting with the original mainline to Sumas at Squalicum Junction, near the present day interchange of I-5 and Sunset Drive. The High Line west of the junction was later cut back and became an long industrial spur. At the end of 1912, Bellingham Bay & British Columbia was purchased by the Chicago, Milwaukee, St. Paul & Pacific as part of its extension into the Puget Sound area. 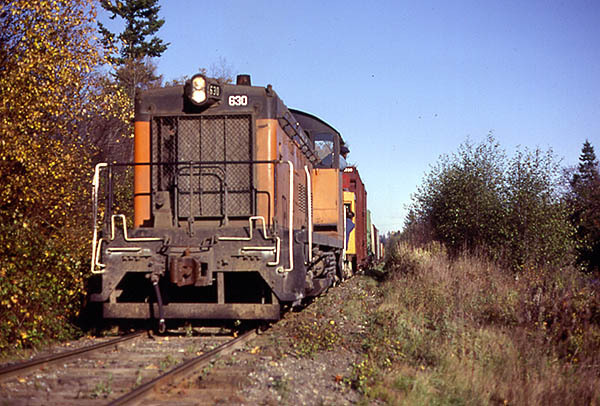 Since there was no physical rail connection with the Milwaukee Road, BB&BC's new owner began ferrying cars between Bellingham and Seattle on barges pulled by tugboats. 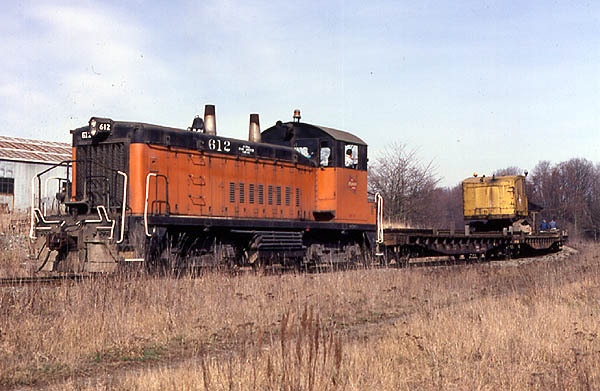 After the purchase, Milwaukee operated the former BB&BC as the Bellingham & Northern until 1918, when the line was fully absorbed into its parent road. 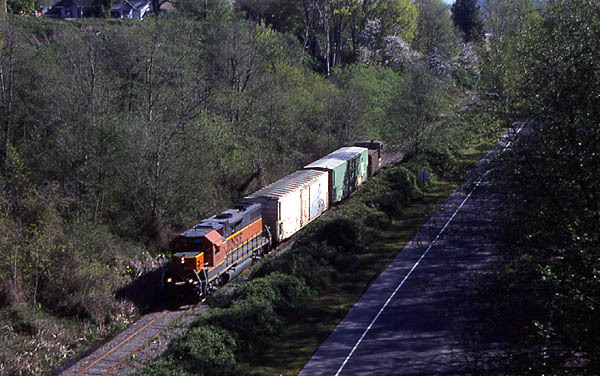 A Milwaukee potash train, received off CP at Sumas, and bound for Portland, reaches the bottom of the Sqaulicum grade and passes under the BN Seattle-Vanouver, mainline -- A Bellingham International train recreates the same scene. BINT tracks begin just a few feet in front of the locomotive, at the point where a spur serving Mount Baker Plywood diverges to the left. During Milwaukee years, the Squalicum line was not only the road's mainline but also was an important customer service area. Several industries were switched along the Bellingham waterfront, including Bellingham Cold Storage's original plant, and Mount Baker Plywood at the foot of the grade up Squalicum Creek ravine. About half way up the ravine, a lengthy spur extended west off the line to reach Columbia Cement's plant, destination for unit "rock trains" hauling limestone from a quarry in the North Cascades foothills east of Sumas. A lumber yard was also located on this spur. At the top of the grade, sidings served a farm supply store and a second Bellingham Cold Storage plant. In the last few years of the Milwaukee operations, the Squalicum line was host to the tri-weekly Bellingham to Sumas turn, powered by the road engines, which brought in trains over BN from Tacoma. Rock trains brought limestone into the cement plant five days a week. 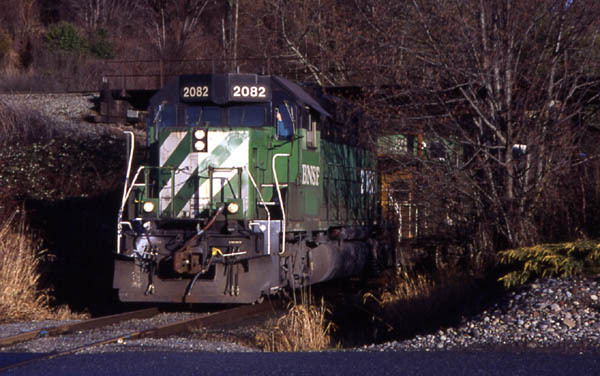 A weekday switcher, usually an SW9 or SW1200 served the other industries. After Milwaukee Road abandoned Bellingham service along with its pullout from the Pacific Northwest at the end of Feb. 1980, the Sqaulicum line tracks passed into ownership of Burlington Northern. Since the cement plant had previously switched to trucks, BN promptly cut the old Milwaukee mainline just beyond the cold storage plant, removing rail to the east. BN also rearranged tracks so that the line now connected directly with their yard at the north end of the Bellingham waterfront, allowing the ex. Milwaukee tracks to be removed south of that point. Milwaukee power returning light to the yard after dropping off limestone loads at the cement plant, passing under Eldridge Avenue. - Bellingham International southbound at same location, nearing the bottom of Sqaulicum grade and the end of BINT track. 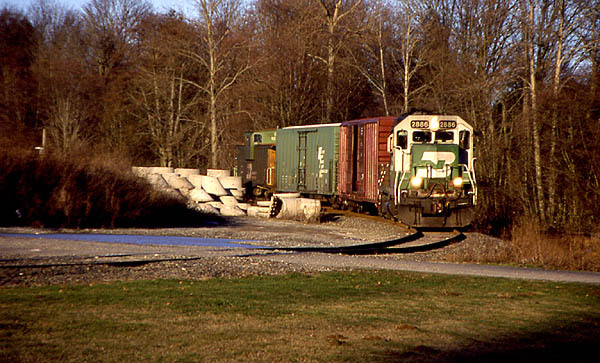 BNSF became the fifth owner of the remainder of the Squalicum line with the merger of BN and Santa Fe in December, 1996. Bellingham Cold Storage was now the only customer above the waterfront, and after the line experienced some serious washouts, BNSF ended service beyond Mount Baker Plywood, at the lower end of the grade. Desiring to restore rail service to their Orchard Street plant, Bellingham Cold Storage purchased the 2.5 mile remnant of the Sqaulicum line from BNSF in the late 1990s. The company named their new rail operation the Bellingham International Railroad to reflect the international character of their business, which includes trade with Asian and Russian markets. Company officials were not at the time aware that their line once extended to the border with Canada and carried international traffic under the Milwaukee Road herald. Today's Bellingham International RR contracts with BNSF for service on the Squalicum Line. Power is provided by BNSF's Bellingham switch engine, an older GP series model. Most weeks, at least one round trip to the cold storage plant is made, with from one to four reefers. A trip on the Bellingham International starts at the north end of the Bellingham yard, along Roeder Avenue on the city waterfront. After picking up any empties for delivery, the train makes a switchback move to enter the former Milwaukee track. The run up the Sqaulicum line is made in reverse, with the engine pushing any cars, and a caboose leading the way on the long back-up move to the cold storage plant. Crossings are flagged. Milwaukee potash train with GE power rounds Pacific Concrete curve southbound on the Squalicum line - BNSF 2886 at same spot on Bellingham International RR 21 years later. The short train crosses Roeder Avenue just out of the yard, goes by the spur to Mount Baker Plywood, at that point entering Bellingham International track and then immediately ducks under a trestle carrying BNSF's Seattle - Vancouver, BC mainline above. Speed is limited to 10 mph on the rough track. On the way to the plant, the train passes under bridges carrying Eldridge Avenue and Northwest Avenue over the tracks. Just before arriving at the cold storage plant, the train stops and then crosses busy Meridian Street, a major city arterial. After any switching at the cold storage plant, the train returns to the yard in proper order, the locomotive leading and caboose trailing. A complete run may take between thirty minutes and an hour. Runs on the Bellingham International are most frequently made around 9 a.m., any day except Sunday. although they may also operate in mid to late afternoon. The absence of a caboose parked at the north of the Bellingham yard most probably means a run is in progress. The caboose is left sitting on the line near its connection to the yard and must be moved for a train to operate on it. Milwaukee switcher 630 pushes on the rear of a Sumas turn nearing Meridian St. crossing. 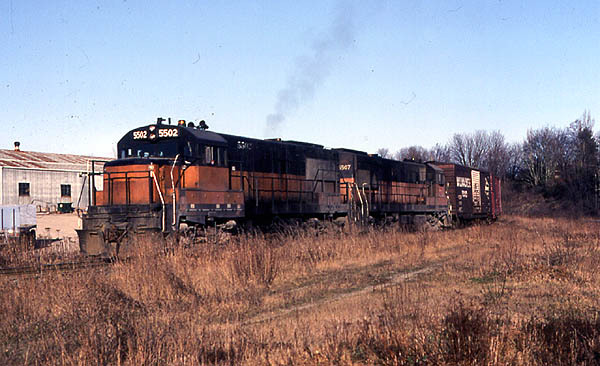 This train was the last run before the short-lived embargo on Oct. 31, 1979. Railfanning the Bellingham International is easy, as Squalicum Parkway closely follows the tracks for their entire length. Due to the slow speed of the train, it can be easily photographed at two or three locations. Both street bridges provide good platforms for photos as well. However, traffic congestion at the Meridian Street crossing can sometimes slow a pursuit. Bellingham International's short trains rolling slowly up and down the Squalicum line today reflect a colorful history steeped in Milwaukee Road black and orange, and provide an interesting subject for railfan photographers who wish to take a break from mainline activity, all within city limits. Bellingham resident Al Currier is a writer for the Bellingham Business Journal and an active member of the Bellingham Railway Museum. He can be reached at alcurrier2@aol.com. This is Al's first byline for NWOR.